You may think of olive oil as a staple for your pantry, but it may also be a staple in your makeup bag as well. This vitamin E-rich beauty powerhouse can help you look younger, keep your skin feeling supple and even calm irritation. Keep a bottle in your bathroom cabinet to explore the benefits of olive oil in skin care as part of your daily beauty routine. Store-bought makeup removers can be harsh, especially when used around the delicate eye area. A bottle of olive oil, however, is one of the most effective and gentle eye makeup removers possible. The olive oil dissolves the makeup, even waterproof mascara, so it slides easily off of your eyes without the need for rubbing or scrubbing. Apply olive oil to a cotton ball, hold it on the eye area for 30 seconds and slide it downward for a makeup-free face at bedtime. Dry, itchy and inflamed skin is usually the sign of skin irritations, such as eczema and psoriasis. Instead of turning to prescription creams and home remedies, reach for some olive oil to relieve discomfort and irritation. 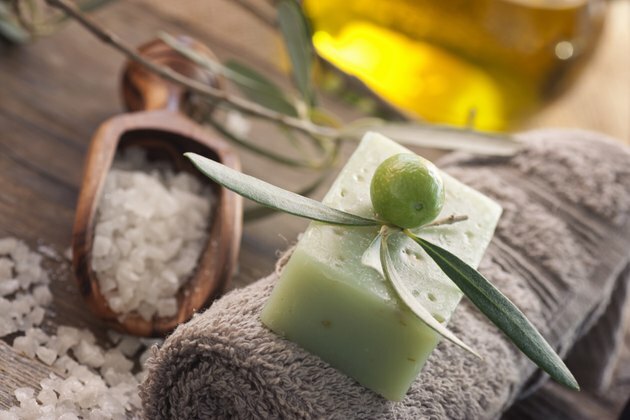 Add a quarter cup of olive oil to a warm bath for all-over relief, or apply the oil directly to irritated areas. Free radicals, sun and pollution can all take a toll on your skin. A study performed by dermatologist Leslie Baumann and published in a 2007 issue of "The Journal of Pathology" found that vitamin E was successful in fighting free radicals, photo aging and damage to maintain younger looking skin. Apply olive oil directly to aging and damaged skin to help maintain a youthful appearance and reduce the toll free radicals takes on your skin.